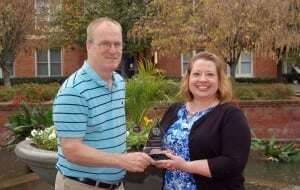 DPR Group Celebrates Liz Palm’s 10-Year Anniversary with the Company - DPR Group, Inc.
DPR Group founder and president, Dan Demaree, presents a crystal award to Liz Palm, director of marketing, in recognition of 10 years of outstanding work. Liz Palm, director of marketing, started with the company as an account coordinator in June of 2003 not long after graduating from Penn State University. In less than two years, she rose to an account executive, representing clients that built unmanned vehicles, components for video surveillance and communication systems, and enterprise management software. While Liz loves the challenge and excitement that came with representing high-tech companies, the pull of the glitz and glamour of the consumer industry was too strong and she stepped away from DPR in 2006 to see what was on the other side of the fence. Liz’s sabbatical would be short lived. About four years later, the planets aligned and president and company owner, Dan Demaree, reached out to her about an open senior account executive position just as Liz was planning a path back to the high-tech B2B space. On October 25, 2010, Liz rejoined the DPR Group team and quickly re-acclimated herself with the best practices of high-tech public relations, helping software, cloud services and industrial automation companies increase brand awareness in key industries, launch new products and services, and build credibility with prospects. Throughout the ensuing years, Liz ascended to her current position and extended her responsibilities to include helping guide DPR Group’s future. With an eye toward industry trends, Liz realized a shift in public relations and marketing that could easily be translated into new service offerings for DPR Group. Liz worked closely with Dan to begin offering these services to established clients and quickly produced significant results. Liz is HubSpot Inbound certified and HubSpot Marketing Software certified, and spearheaded DPR Group’s HubSpot agency certification. Today, Liz develops and executes targeted and successful communications campaigns that integrate multi-channel marketing tactics to maximize impact. Her dedication to keeping abreast of changing trends translates to innovative initiatives that are ahead of the curve, allowing her companies and clients to benefit from the reach and immediacy of leading tools.